Hey everyone! Travis back with a very quick update for all of you cupcake lovers. 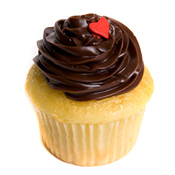 One of the hottest spots in Tampa Bay for cupcakes - The Cupcake Spot - was actually profiled by Delta&apos;s Sky Magazine as a destination dining place in Tampa Bay! Now, this would normally be enough to convince EVERYONE that they need to stop by and pick up a "The Chocolate Elvis" or a "Fuzzy Berry", but I&apos;ve got another reason - recently Shaquille O’Neal visited the Tampa location for one of their "Swirley Temple" cuppies. Now, I don&apos;t know how many he had, but that&apos;s got to tell you something. So, make sure you check them out and swing by and pick up at least one (including one for me)! www.thecupcakespotinc.com. And as always, keep checking back for more great things to do in Tampa Bay, and other Tampa Bay area events.